Described by one of her children as a ‘book writing machine’, Melissa Pouliot author has always loved to write. Her early childhood stories about princesses, fairies and goblins inspired by authors such as Enid Blyton and May Gibbs evolved to teenage soap operas and adventure stories inspired by Trixie Beldon, Sweet Valley High and her own experiences. While studying a Commerce university degree, she wrote her first unpublished piece for friends and family based on when she worked a governess on a sheep station in outback Queensland. After an epiphany on a train late one night in Sydney, she changed her university studies from numbers to words. 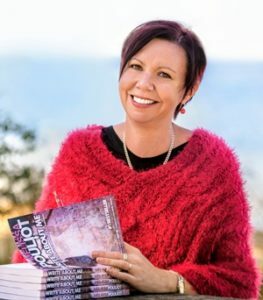 She pursued her love of writing through a journalism career that took her from the dusty outback heat of the outback to the dry arid landscapes of Western Victoria. After leaving the newsroom she continued to write through her media-based public relations and marketing agency mp|media solutions. Through her journalism career and her own business, she has written stories on just about every topic. Her stories about people are widely recognised as her true heart and she has published several non-fiction books. Melissa’s crime mystery fiction novels are part of her quest to highlight the long-term effects on families and friends when someone goes missing. Her debut novel Write About Me, is an international bestseller. In 2014 she released the second novel in the series, FIND ME, which closely follows the life of young policewoman Rhiannon McVee. Rhiannon starts her career in the late 1980s in outback Queensland before moving to Kings Cross in Sydney. FIND ME has also sat in the #1 position on Amazon, the biggest bookstore in the world, several times. Melissa’s third novel, When You Find Me, picks up Rhiannon McVee’s story where FIND ME left off, and moves into a new decade, the 90s. The third novel in the series, published in 2016, is You’ll Never Find Me. Melissa has readers from around the world waiting patiently, and impatiently, to see what happens next, and she is currently working on the fourth novel in this series. In 2017 the Australian Federal Police launched Melissa’s fifth crime novel FOUND in Canberra. Through her fiction writing she has become a strong advocate for missing people around the world, and is the founder of Picnic for Missing, an annual event where people celebrate and honour the memories of their missing loved one. In 2015 the Daniel Morcombe Foundation appointed Melissa as a Day for Daniel 2015 Ambassador. She was also the guest speaker at the official launch of the 2015 National Missing Persons Week at Customs House in Sydney, organised by the AFP National Missing Persons Coordination Centre. She also works with her local community in the Bega Valley to host Australia’s only regional launches of National Missing Persons Week. Melissa lives with her family at Merimbula on the NSW South Coast where she writes every single day.